The welfare of our animals is our number one priority. If our animals are not well, not safe or abused, we cannot properly provide our services. It is imperative that the customer and visitors understand that if Mary sees a hazard or something that may be a danger to the animals, if it cannot be removed, she will fence around the danger. Anytime Mary feels that visitors are endangering the animals, they will be asked to leave the site. If the situation is not resolved and the customer cannot remove the visitors, then Mary will remove the animals from site with the full payment expected, even if the job is incomplete. We do not tolerate abuse of our animals, nor will we deliberately endanger them by allowing people to harm or tease them. If the weather becomes dangerous, we reserve the right to ‘bug out’ until the danger is passed. Tornado warnings, severe storms, or other natural disasters may force the crew to evacuate. If there is shelter, safe enough to house the animals in, during a severe storm, we will utilize it, instead of leaving the site. We will load the animals and leave the fences behind, then return after the danger is passed. Any animal that becomes ill, while on site, is cared for by Mary. She carries any medications that might be needed for the most obvious illnesses. If there is an illness or an accident that requires veterinarian care, Mary will transport the animal or call a veterinarian to the site, to treat the animal. We do not tolerate people teasing the dogs or trying to command them. The working dogs are trained specifically to follow Mary’s commands. Anyone attempting to control the dogs will find the dogs uncooperative and may become agitated, please don’t push your luck with the dogs. Parents with small children are advised that Border Collies are not as child friendly as other breeds. While they enjoy the attention of their admirers, we ask you do not allow your children to put their faces into the faces of our dogs, that is a sign of aggression. Please do not allow your children to push on the dogs, pull hair or squeeze their necks. We want visitors to be safe too, but they need to understand that they are responsible for their actions and parents are responsible for their child’s actions. Mary was very knowledgeable and went the distance to get the job done. The goats got into the most inaccessible areas and destroyed the weeds. She moved the fence many times to get the hers to a new area to clear. Outstanding job. The kids loved to talk to her and watch the goats. I just want to commend Mary and her goats. 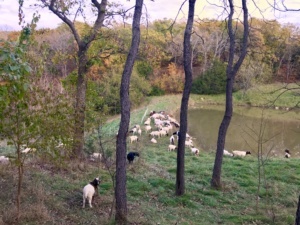 It was wonderful to be able to walk in my pasture now that the goats cleared every sign of poison ivy. Fantastic job! Mary, the goats, & dogs worked their magic. It was a joy watching the goats in action! Mary and goats are great! She works her dogs with the goats to keep them under control! Great way to clear those impossible to mow areas! Mary is amazing – she unloads the goats, puts up the fence, moves the fence, untangles the goats! And they clear down to bare ground. What a great job and great entertainment to boot! This is an excellent way to get rid of unwanted brush and poison ivy. It’s amazing to watch the goats go to work. Mary and her team of dogs do a great job of keeping the goats contained, the goats are happy to munch away. Couldn’t be any more pleased with the results. I highly recommend this service – it’s natures way to keep brush and over growth under control. Need a Guest Speaker? Book Mary!